Just after the makeover, Orkut introduced lot of new feature including: Friends suggestions by Orkut. Based on similar lines, now Orkut will suggest new groups based on your user activity. It will suggest labels for new groups and possible Orkut friends in each group. You can accept or reject any auto suggested group and make life easy following Orkut friends group-wise. 1. Goto Orkut.com & login into your account. 2. Click “edit groups” link. 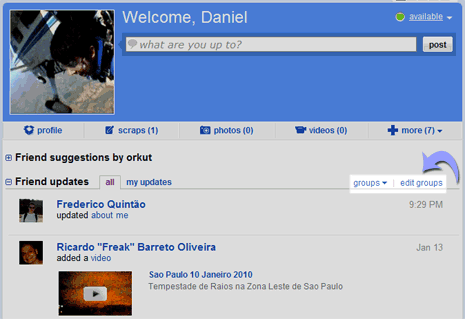 It will show groups you previously created, as well new groups suggested by orkut. Suggestions for making orkut friends groups.